NASHVILLE (WTVD) -- Monday Morning Quarterbacks spent more time talking about the banner Panthers QB Cam Newton ripped down than about a statement win over Green Bay. 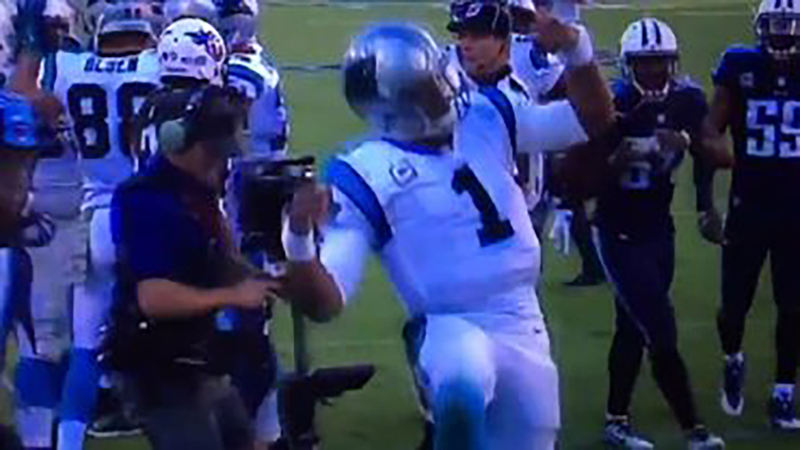 Seven days later the team's 9-0 start is being overshadowed by Newton's dance moves. Already frustrated, Newton ticked the Titans to titanic proportions with a touchdown celebration suggested by his 16-year-old brother, Caylin. Newton replaced his typical "Superman" pose with the "Dab." Newton explained the conversation, "Tell me what to do 'Dab on them folks,' so I tried "Dab on them folks." Hadn't heard of it before Sunday? You're not alone. After a rushing touchdown late in the 4th quarter, Cam Newton busted a move in the end zone. Tennessee Titans' linebacker Wesley Woodyard Jr. didn't seem to like it. After the dance he appears to get in Newton's face before the refs separate them. Linebacker Avery Williamson also tried to intervene, which caused Newton to do an extended version of the Dab dance. "I heard somebody say you know we're not going to allow you do that. But I'm a firm believe that if you don't want me to do that then don't let me in (the endzone). I just like doing it man. It's not just to be boastful, but from a crowd's response, they like seeing it," said Newton. Carolina won the game 27-10 to remain unbeaten at 9-0. Keep Pounding, ripping, and dancing deep into January.